While the pull-up is not officially a part of the PT test, it is an exceptional strength/muscle builder. Done correctly, it will build your forearms, biceps, back, and core. If you do enough of them with good technique, you will be the object of awe! Use full range of motion. That means starting in the full-hang position (where your body is fully lowered) and ending with your head at or above the bar (depending on the kind of pull-up you are doing). Try to touch the bar with your chest, pulling your shoulder blades back as you move towards the bar. 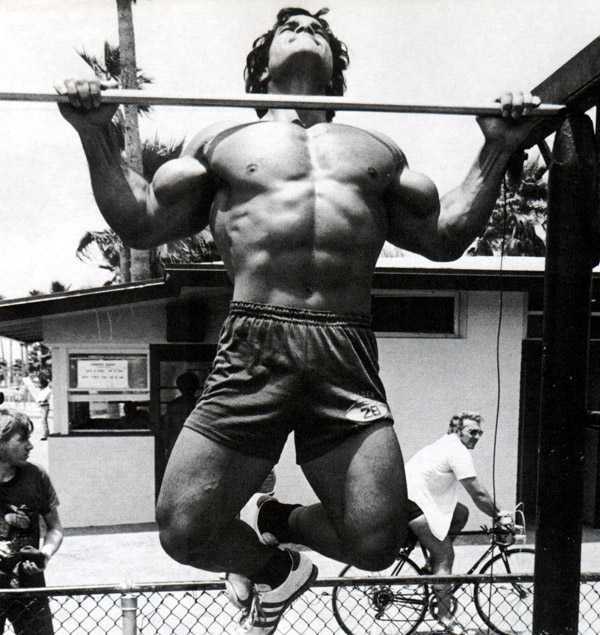 Because the pull-up requires a lot of upper body strength, most people will struggle with the pull-up. When people go to the gym to fix this problem, they will usually find it incredibly difficult to get started. Here are some helpful solutions. The simplest way to develop pull-up strength is to get yourself up into the pull-up position and then slowly lower yourself. Slowly lowering a weight is called a negative and exposes your muscles to weight that it can't normally lift. If you aren't feeling the negatives, then you can use special straps that wrap around both a pull-up bar and your foot, which can help you develop pull-up strength without a machine. When you become strong enough to do a pull-up on your own, you still might need help. If this is your problem, then I suggest that you assist yourself with a chair or step stool. This chair or stool will be placed either behind or in front of you so that you can only provide just enough support from your legs. As you get stronger, push the chair or stool farther away from you until you can do several pull-ups on your own. How Often Should I Develop Pull-Up Strength? While you are focused on doing several unassisted pull-ups, you should do no more than 5 sets of pull-ups (3-5 reps for each set) three days a week (e.g., Mon, Wed, Fri). This should provide adequate stimulus for strength development. Keep working towards accomplishing 20 consecutive, proper, dead-hang pull-ups. Once you get to this point, you'll be in pretty good shape. Then you can start to do some of the more crazy pull-ups found on YouTube (the awesomeness below starts at 1:48).